From October 2016 to November 2017, the Honors College celebrated its 60th Anniversary. 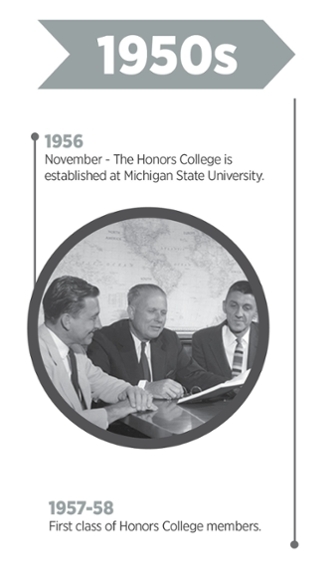 The Honors College at Michigan State University is one of the oldest honors programs at large public universities, having been established in 1956. The Academic Council, the Academic Senate and State Board of Agriculture (the official governing body of the University at the time) approved a proposal from the Committee on Instruction, Curriculum, and Research to establish an Honors College. The College subsequently began operations in Fall Term 1957, with the first formal graduating class in 1959. Thomas Hamilton, Dean of the Basic College and later Vice President for Academic Affairs, drafted the first Honors College proposal and presented the proposal to the academic governance system for approval. President John Hannah, Vice President Thomas Hamilton, and faculty recognized that a single, standard course of study was unlikely to serve all types of students well. So, the Honors College was proposed to help create different academic approaches and opportunities for what was then called “the very able student.” Key objectives were to allow students to be challenged by the appropriate level of academic work specific to each student and to meet the needs of each student by providing substantial academic flexibility. The report adopted by the Council and Senate identified the Honors College “as the agency responsible for working with the existing colleges to provide a special educational experience for … students of superior ability and achievement.” From the beginning it was intended that Honors College be university-wide; MSU undergraduates in any academic major could also be members of the Honors College. 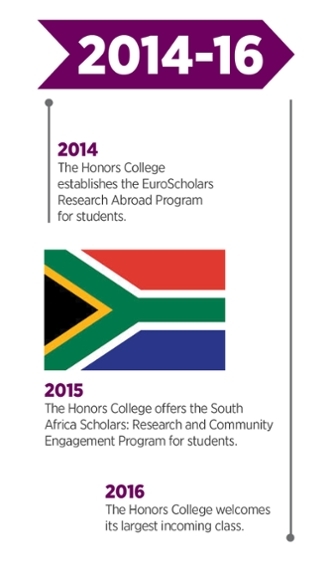 Initially, students applied to join Honors College after their first year. 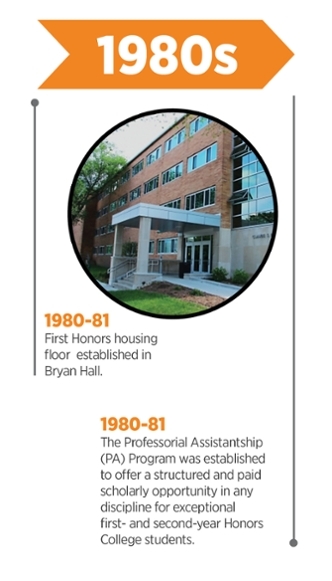 Beginning in 1970 as a trial program, entering freshmen were invited to join the Honors College, a practice made permanent by Academic Council in 1973. 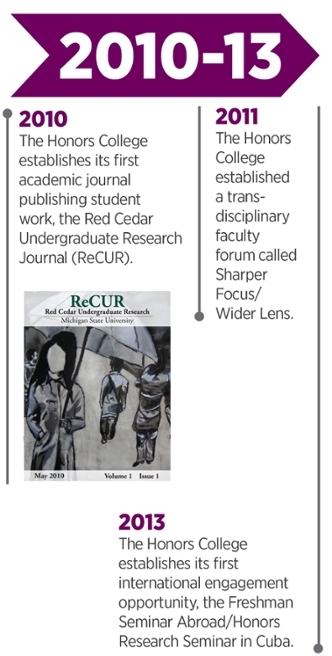 Over the years, a system evolved so that Honors classes taught by MSU faculty are offered through the various academic colleges and departments at MSU, and Honors College students work with faculty on research throughout the university. 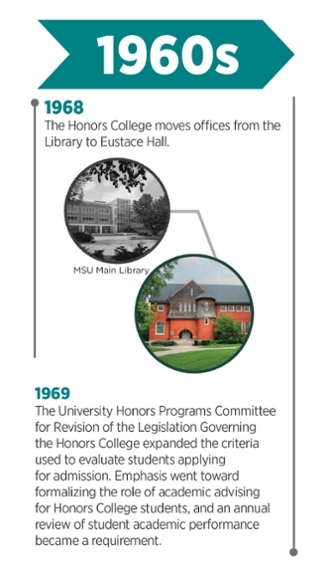 In 1968, the Honors College offices moved from the Library to Eustace Hall, originally designed as a horticulture laboratory by Liberty Hyde Bailey. 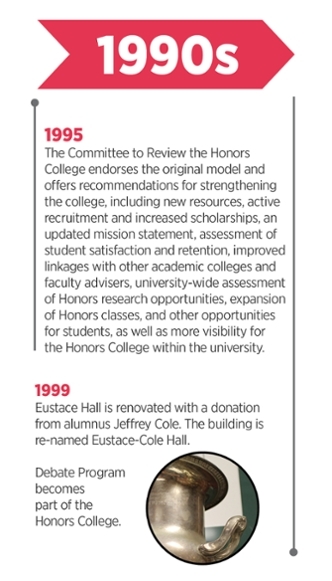 In 1999, Eustace Hall was completely renovated as the result of a major private gift from Jeffrey and Kathryn Cole and the building was renamed Eustace-Cole Hall. In addition to staff offices, this facility provides lounge and study space for members, and rooms for Honors classes and seminars. A major hallmark of the Honors College program is the academic flexibility afforded our members. The original Honors College legislation created the foundation for each student, in cooperation with their faculty academic advisor, to craft a personalized academic program that both challenged the student and met all major requirements. Today, in addition to the core honors program for high-achieving undergraduates, the Honors College also includes the Academic Scholars Program, the National/International Fellowships & Scholarships Office, and the MSU Debate Program. Each year, the Honors College serves more than 4,000 members and up to 400 students involved in the Academic Scholars Program, about eight percent of undergraduates total. 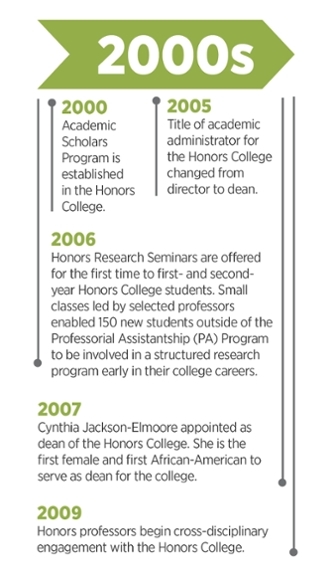 *The title of academic administrator for the Honors College changed from director to dean in 2005.